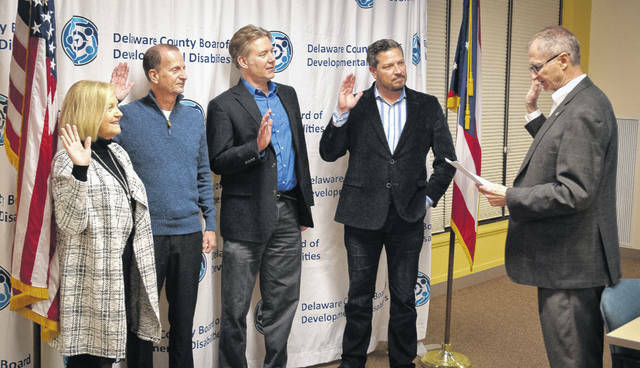 Newly appointed Delaware County Board of Developmental Disabilities members were sworn in Thursday evening by Delaware Commissioner Gary Merrell. The photo shows, from left to right, Dana Lehman, Stephen Finney, Theodore Klecker, and Louis Borowicz being sworn in by Merrell. Proud, excited and ready to serve, the newly appointed members of Delaware County Board of Developmental Disabilities (DCBDD) were sworn in Thursday evening by Delaware County Commissioner Gary Merrell. This entry was tagged D. Anthony Botkin, Dana Lehman, Delaware County Board of Disabilities, Gary Merrell, Louis Borowicz, Stephen Finney, Theodore Klecker. Bookmark the permalink.